In response to the Day 133 Café da Manhã post, Ray mentioned a meat product that was unfamiliar to me – Mortadela. So I thought I would try some for lunch yesterday – Day 143 of my challenge to be more like the Brazilians. Perhaps I’ll surprise my Brazilian husband with this for breakfast tomorrow. Gallery | This entry was posted in 366 day Brazilian Challenge, Expatriate Info & Advice, Foreigner Insights and tagged American, brazil, culture, expat, expatriate, food, life, meat, Mortadela. Bookmark the permalink. ROMAN MEAL!!! We had to eat that, too. 🙂 My dad also used wheat germ as an ice cream topping- Ioved it. We grew up near Italian immigrants….so had mortadela. It’s a little different here, but I like it. But…uh…can only get it if I go somewhere else. Buritis does not have it. Ugh i hate this stuff. My inlaws always try to give me some… I just can’t do it. I really don’t enjoy processed meats. I love your blog… this whole journey is so fun! A bit more brazilian, every day! Thank you! I don’t think you are losing any nutrition over your decision not to eat it. So don’t worry. I don’t know how you did prepare it, but if you warm a little bit in a frying pan, or a tostex (http://gutocapucho.zip.net/images/tostex.jpg) it gets much better :). Tostex is better than the sandwich maker, the bread will get a crunchier crust. There are tostex for both ‘pão francês’ and ‘pão de forma’. I don’t want to diminish my relative’s product, but real Bologna’s mortadella is lighter (in terms of color), fattier, softier and tastier… By the way, eating light mortadella with Islamic certification is a mortal sin. Move to the full one! Anyway, it’s a real Paulistana experience brought by the people of Emilia and Veneto! From Wikipedia: Halal (Arabic: lawful) is a term designating any object or an action which is permissible to use or engage in, according to Islamic law. The term is used to designate food seen as permissible according to Islamic law. The opposite of this word is haraam. I was wonder who was going to call me out on the “light” version… I’m working my way up slowly from Mortadela light to one of those big sandwiches at the Mercado as Ray suggested. 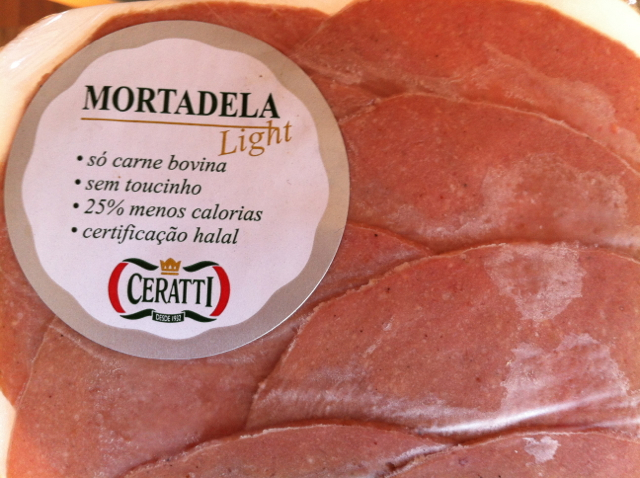 Ceratti’s mortadela is still low-fat when compared to Bologna’s mortadella. So, go ahead! Do you want to buy a new apartment? That’s my business. You pay now, I hope I can give you the keys later! Ceratti’s high-fat mortadela is still low-fat when… That’s what I meant!